They haven’t changed the seat design with the hidden word “Connex” in it — it’s not very obvious and probably a hassle to do. But even some of the electronic signs stubbornly revert to the former train operator’s name occasionally. 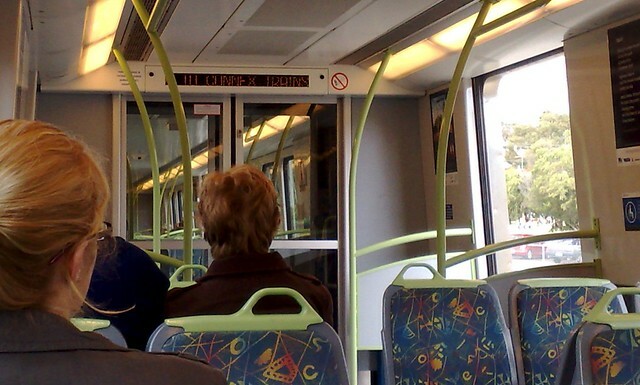 These two were snapped in the last month or two, both on X’Trapolis trains. Perhaps deep in the heart of the machine, the words of the company that originally commissioned them is destined never to be totally removed. Until quite recently, some of the screens at CBD station would display a Connex logo when not displaying any information, and reverting to their “Listen for announcements” state. The train I took to work on Tuesday had that sign up too. I was rather amused. It changed to Metro just before it left the station. I’d like to think that the money saved by not attending to these issues is actually going towards the provision of additional services and train maintenance. THAT would be progress! 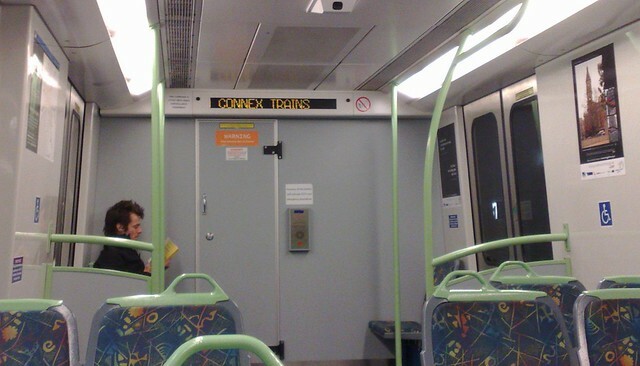 These trains always say Welcome to Connex when they’re sitting at Flinders Street. The initial message ‘Welcome to Connex’ is probably stored in a form of persistent memory that can’t easily be changed. I’ll assume that this will be resolved when all first generation X’traps are modified (New larger PIDs, Emergency Intercom consoles, Upgraded core systems, Installation of wheelchair ramps cages next to the front doors) to be compatible with the newer generation X’traps rolling out now. Ha! I’d bet there’s still a few Bayside/Hillside signs around, and when M<Trams was meant to be obliterated (a one-night exercise), they missed a few Swanston Trams signs :-o.
There’s also a few very old The Met signs still around … (try Heatherdale). I was on a bus yesterday (route 512, Strathmore to East Coburg), and the seats were covered in a swirly-patterned fabric, similar to the Connex ones in the picture above, that looked like it might contain a word. I spent ages trying to figure out what the word might be, with no luck. It drove me crazy. Damn you, Daniel. It’s all your fault. :-) I never knew the word Connex was in the train seat covers at all until you pointed it out.